Breakthrough? Ukrainian President, Opposition Leaders Reach Deal : The Two-Way The deadly crisis may be coming to an end. President Viktor Yanukovych and three leaders of the protests against his government agreed on a plan for a unity government and new elections. We're updating this post as the day continues. 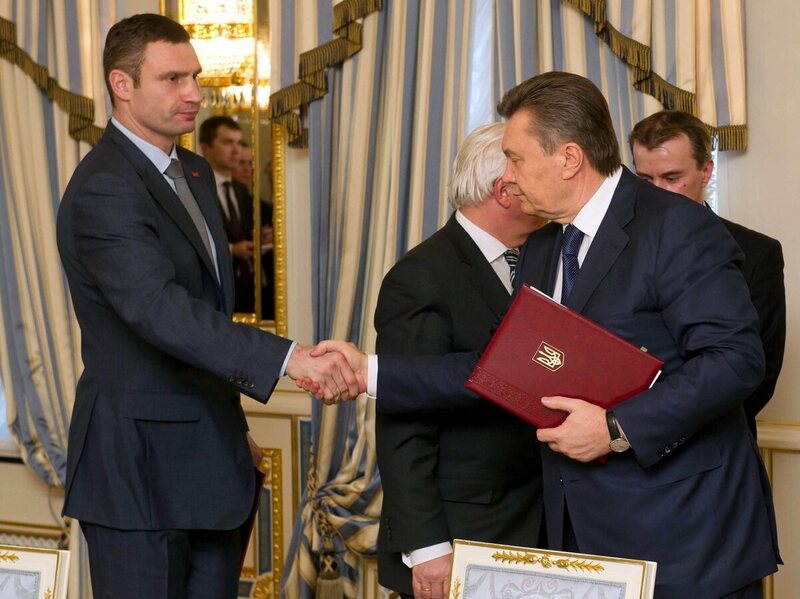 Ukrainian President Viktor Yanukovych (right) and opposition leader Vitali Klitschko shake hands Friday after signing an agreement that diplomats hope will end the bloodshed in Kiev. In what could be a major move toward ending the violence in the streets of his capital, Ukrainian President Viktor Yanukovych and leaders of the anti-government opposition reached agreement Friday on a deal to hold new elections, form a unity government and restore a constitution drafted in 2004. "Yanukovych has agreed to an early presidential election as part of a deal to end the long-running crisis. He said he had also agreed to a national unity government, and to make constitutional changes reducing the power of the president. The compromise came after hours of talks with the opposition leaders. "The opposition has not spoken about the deal and it remains unclear whether protesters will back it." NPR's Soraya Sarhaddi Nelson, who is in Kiev, tells our Newscast Desk that along with the formation of a unity government and new elections by December, Yanukovych has agreed to "constitutional changes to reduce the power of the presidency." — 6:23 p.m. ET: President Obama spoke to Russian President Vladimir Putin on Friday. The Hill quotes a senior State Department official saying the talk was "constructive." "They agreed the agreement reached today needed to be implemented quickly," the official said. — 9:30 a.m. ET: German Foreign Minister Frank-Walter Steinmeier, who witnessed the deal's signing, issues a statement commending the parties "for their courage and commitment to the agreement" and calling for "an immediate end to all violence and confrontation in Ukraine." — 9:10 a.m. ET: The deal has been signed by Yanukovych and three leaders of the opposition, according to reports from Reuters, the BBC and other news outlets. — 8:35 a.m. ET: All opposition leaders are at the president's office and are "poised to sign the agreement," Reuters reports. "In these tragic days, when Ukraine suffered such heavy losses, when people died on both sides of the conflict, I consider it my duty to the bright memory of the deceased to declare that there is nothing more important than human life. There are no steps that we must not do together to restore peace in Ukraine. "I declare steps that must be done to restore peace and avoid more victims of the confrontation. "I declare that I initiate early presidential elections. "I initiate the return of the Constitution of the year 2004 with redistribution of powers aside parliamentary republic. "I call to begin the procedure of establishing the government of national trust. "As Ukrainian President and Guarantor of the Constitution, I fulfill my duty to the people, to Ukraine and to God for the sake of preservation of state, for the sake of saving the life of people, for the sake of peace in our land." There's "a great deal of skepticism" among protesters about the deal, and it may not satisfy many of them, Soraya adds. But by early afternoon in Kiev, opposition leader Vitali Klitschko was telling Germany's Bild that "we will sign the deal." Shortly after that, there was word from a Reuters correspondent who witnessed the event that Yanukovych and three opposition leaders had signed the deal. "The Foreign Ministers of France, Germany and Poland welcome the signing of the agreement on the Settlement of the crisis in Ukraine, commend the parties for their courage and commitment to the agreement and call for an immediate end to all violence and confrontation in Ukraine." The BBC reported that "the three opposition leaders who signed the deal at the presidential palace are: Vitali Klitschko of the pro-EU Udar movement, Arseniy Yatsenyuk of the main opposition Fatherland and Oleh Tyahnybok of the far-right Svoboda." 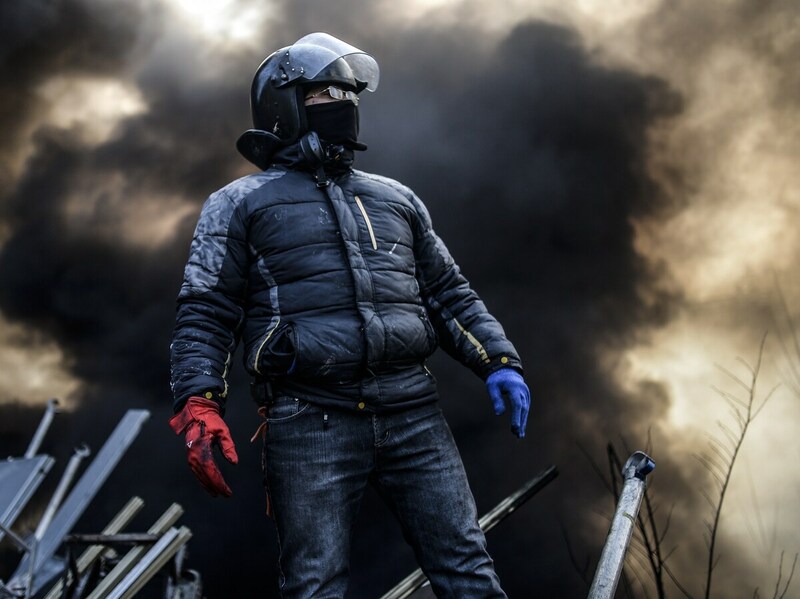 Soraya says it is "amazing what has happened overnight" in Kiev, where she's been reporting from this week. Just 24 hours earlier, as she had said Thursday, it was "absolute chaos" in the city's Independence Square. Clashes between security forces and protesters left dozens of people dead. More than 70 have been killed since violence erupted Tuesday. By midday Friday in Kiev, as Soraya reported on Morning Edition, much of the "debris and chaos had been swept up and swept away." One dramatic moment: the arrival of police officers from the city of Lviv. They announced they were there to support the protesters, Soraya said. The scene is "180 degrees different," Soraya added. As we've reported before, the anti-Yanukovych protests that have been raging for weeks were sparked in part by the president's rejection of a pending trade treaty with the European Union and his embrace of more aid from Russia. Protesters have also been drawn into the streets to demonstrate against government corruption. Even as word was emerging about a possible end to the crisis, anti-government protesters remained in Kiev's Independence Square early Friday.